MUTARE, Zimbabwe, Mar 22 2016 (IPS) - A narrow dirty trail snakes through what used to be a small dam in Mpudzi Resettlement Scheme south of the eastern border city of Mutare. And what remains of this once perennial dam is just a small puddle of mudded water; the dirty water is completely covered with thick green algae. The dam used to provide water for livestock and non-drinking uses for the surrounding villages. And this dam could have overflowed had it been a good rainy season as the area receives much of the rainfall between February and April every year. 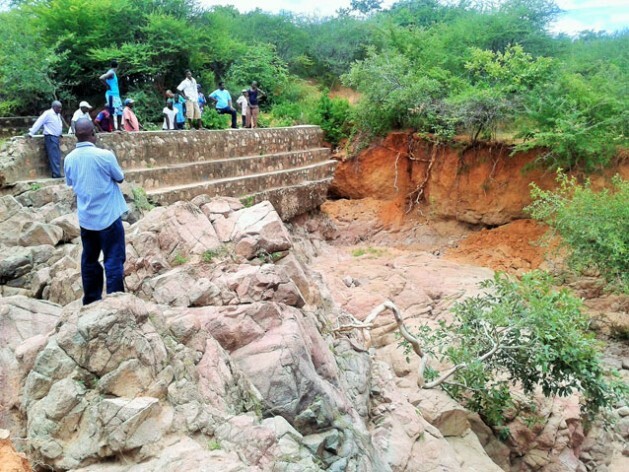 However, as the rainy season this year comes to an end, hopes of an increase in water levels in the dam are fast fading. Some rivers, Chitora, Mushaamhuru and Nyadziye which run through Mpudzi resettlement area are also drying up. These rivers, which were once perennial, would have been in spate by March but the El Nino- induced drought which ravaged the country has left them dry. Zimbabwe, smarting from another drought last year, received low rains this season. The El Nino phenomenon is caused by warming in the Pacific Ocean and according to experts this results in a 70 per cent chance of a drought in Zimbabwe. This year’s El Nino condition has been severe, resulting in crippling drought in many countries in the Southern African region. “The situation doesn’t look very good for us and our livestock,” a local villager, Elijah Ngwarati told IPS. Electricity generation at Chipendeke Micro Hydro Power Station has become erratic due to low water levels in Chitora. In Buhera district west of the city of Mutare, villagers are travelling up to 12 kilometres in search of water. This situation will worsen when rivers dry up. “Women are travelling long distances to get water. As you can see this area is very dry. The river is very far from here,” said Shellington Tavaringana, a 63 year-old villager from Buhera. Save (Sabi) River provides water for irrigation, domestic use and is also a source of fish for local communities in the low veld areas in Chipinge district. “But the (water) situation now is really bad. Musirizwi River is almost dry while water in Save is very low. I have approached NGOs to help drilling boreholes in the area and I am expecting a response this month,” said Prosper Mutseyami who is the legislator for Musikavanhu constituency in Chipinge district. Major urban centres have also not been spared by the devastating drought, particularly those in the southern parts of the country. According to the country’s water national authority, the Zimbabwe National Water Authority (ZNWA), dams which supply water to cities and towns like Masvingo, Plumtree, Gwanda, Beitbridge and Bulawayo were below 50 per cent of their capacity early this year. The country’s biggest inland dam, Mutirikwi, which supplies water to Masvingo city and the commercial sugar farms in the low veld, is left with only 25 per cent of its capacity. ZNWA warned that serious water shortages in some areas in the country are likely. In a recent report the water authority said: “While the responsibility to come up with cost effective and quickly implementable measures lie with government, the ZNWA and other relevant stakeholders in the water sector, the success of such measures is dependent on the commitment of all water users to practice water conservation”. ZNWA advised that rainwater harvesting — even in a season of low rainfall — should be practised. Harvested rainwater can be used for non-drinking household chores like washing clothes, watering gardens or flushing toilets. A World Bank Group report revealed that in addition to the central role of water in Zimbabwe’s agricultural sector, water availability also had direct socio-economic implications for other sectors such as health and energy. “Energy production which underpins most other production sectors relies largely on the flow of the Zambezi River either of hydropower generation or for the cooling of (Hwange) thermal power stations,” the Bank report said. The national hydro power station at Kariba Dam has been greatly affected by the drop in water levels to 12 per cent by February with electricity generation dropping to mere 285 megawatts from an installed capacity of 750 megawatts. The report also noted that per capita availability of water was projected to fall by as much as 38 per cent by 2050 in Zimbabwe, even with low population growth. And against this background, the World Bank Group is working with the government to address the impact of climate change on the availability of water by integrating sustainable water development and management into the country’s National Climate Change Response Strategy (NCCRS) and into the proposed National Climate Policy. Under the NCCRS, the United Nation Development Programme mobilised a US$4 million special fund to support climate change initiatives to benefit up to 10 000 smallholder farmers in three districts in the country. The fund will help to construct and rehabilitate dams, irrigation schemes, rainwater harvesting and boreholes drilling in Chimanimani and Buhera districts in Manicaland province and Chiredzi district in Masvingo province. The project, which was launched in Mutare last year, will run for four years with US $1 million to be released each year.